Apparently this week is the last that will focus on profiles in the Let’s Face It course. Phew. Profiles have definitely not been easy. A face in profile has a strong outline but getting the proportions right is something I seem to find very tricky indeed. I do think, however, that concentrating on profiles over the last few weeks has taken my abilities a step forward and I think this week’s painting is my best profile so far. 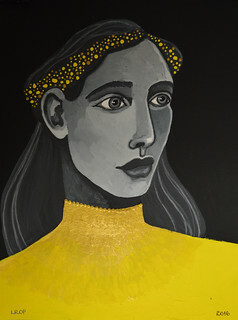 The lesson was taken by Kara Bullock and – as with her previous lesson that led me to create Girl in Grey and Gold – the idea was to paint all the tonal values in monochrome and then add a splash of a single vivid colour. The work of art that formed the basis of Bullock’s tutorial involved painting butterflies but I knew I would find that to be a struggle. Painting aesthetically pleasing butterflies and flowers in acrylic is probably a stretch for me right now. 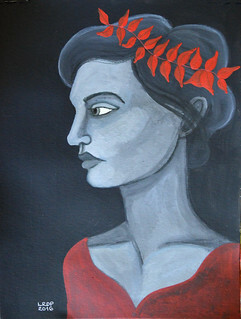 My solution, therefore, to make the colour element in the composition work was to create a diadem of red leaves. The leaves still are not great but I am pretty confident they are better than either flowers or butterflies would have been. This might be my last profile for this particular course but I am going to continue to practice them. Over on my Pict Ink blog, I have embarked on a project to draw 100 ink and watercolour illustrations of faces – coincidentally also all a balance of monochrome with splashes of colour. My objective is to build my skills with constructing a wider variety of faces and to improve my ability to draw expressive faces. This week’s Let’s Face It lesson was taken by Juna Biagioni. The way Biagioni paints is fascinating to watch, the way she pulls form and detail out of broad strokes and lots of layers. It is not a method I have any competence with, as became clear from my attempt at her last lesson. Perhaps more significantly, it is not a style I aspire to because it is just not “me”. I am definitely more of an illustrator than a painter. I, therefore, decided to use the essence of the lesson but apply it to a much more illustrative piece. In doing so, I could do the chunky brush strokes and the layering but not have to contend with keeping proportions realistic. What emerged on the page is not great but at least it is authentically “me”. Last week’s Let’s Face It lesson was taken by Kara Bullock. The focus of the lesson was on rendering flesh tones in tones of grey and then introducing a pop of a single colour. Again wanting to meld the lesson content with my own illustrative style, I drew from my imagination rather than using any reference material. In doing so, I notice that my faces all tend to look pretty similar. I am not sure whether that is a good thing or not: does it signify that I have a strong style or does it indicate that I am stuck in a rut? I chose yellow for my contrasting colour. 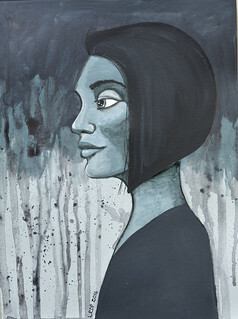 I thought it would complement the grey and add brightness to a painting that is otherwise very dark. I find it difficult to resist metallics so I introduced some gold elements in the headpiece and around the neckline. I enjoyed rendering the face in monochrome but I definitely need to work on making the faces I draw more varied.